A North American study of 52 infants with colic shows that babies given Lactobacillus reuteri Protectis cry and fuss less compared to babies given placebo. The newly published study is the fourth positive colic study with Lactobacillus reuteri Protectis and the results confirm the positive results of earlier studies. 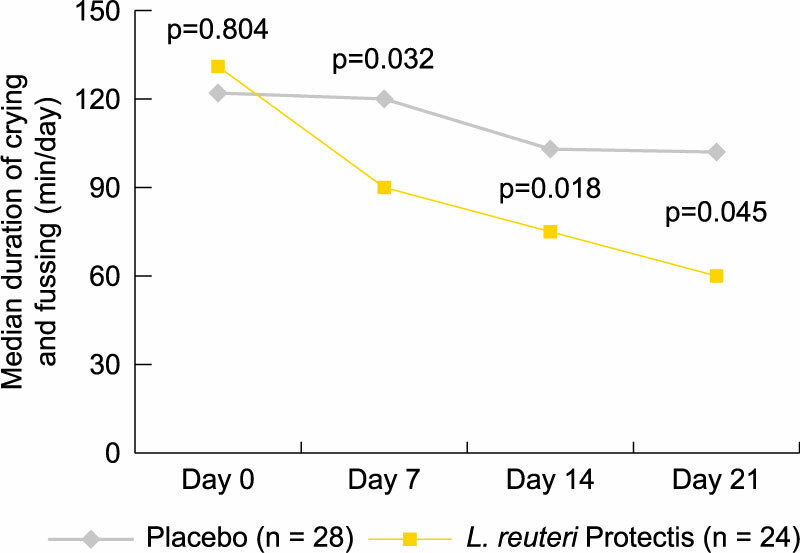 After seven days of treatment crying and fussing was reduced by more than 40 minutes per day in infants given Lactobacillus reuteri Protectis, whereas there was practically no reduction in the placebo group. Crying and fussing continued to decrease significantly in the Lactobacillus reuteri Protectis group throughout the 21-day long study period. In the placebo group this decrease was significantly smaller. The study was published in the prestigious Journal of Pediatrics 24 October 2014. More information on colic, study details and previous colic studies with Lactobacillus reuteri Protectis is found through the attached links. "With this study – the fourth independent, positive study with Lactobacillus reuteri Protectis on colic – we further strengthen our position in the paediatric field. Furthermore, it is valuable that we now also have strong data in this field from a study conducted in North America”, says Peter Rothschild, President, BioGaia. BioGaia has published this information in accordance with the Swedish Securities Market Act. The information was issued for publication on 24 October 2014, 09:00 am CET. With this study – the fourth independent, positive study with Lactobacillus reuteri Protectis on colic – we further strengthen our position in the paediatric field. Furthermore, it is valuable that we now also have strong data in this field from a study conducted in North America.